Combining a proven technique with an effective and easy-to-use supplements package, Ear Training: A Technique for Listening is the ideal text for college aural skills courses. Its logical progression in the coverage of skills enables students to build gradually to full proficiency, while ensuring that material they learn early in the course remains fresh. Its flexibility makes it equally effective in a lab-based course, in a instructor-guided setting, or in a course that combines the two. 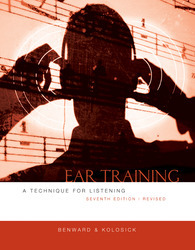 For the revised edition, the online site developed in conjunction with Ear Training: A Technique for Listening has been totally revised to provide a reliable and user-friendly environment for drill and practice of the skills developed in the text. Activities such as melodic dictation, interval detection, chord quality identification, and rhythmic error detection mirror similar exercises in the text and serve to reinforce a broad range of aural skills. A completely redesigned and user-friendly companion website contains activities such as melodic dictation, interval detection, chord quality identification, and rhythmic error detection that mirror exercises in the text and serve to reinforce a broad range of aural skills. The online exercises have been revised to work with the latest browsers and operating systems. Ear Training Online is web-based, platform independent, and compatible with other Learning Management Systems. Note entry has been revised to be easier and more intuitive. Extensive support package includes not only the online learning center but also supplementary recordings and an Instructor's Edition that contains the complete student text along with answers to the exercises and suggestions/teaching strategies that help present the material in the most effective light. Offers a wide variety of exercises for the course, including pop and jazz chord progressions for analysis and dictation. Exercises in the skills' areas alternate between fundamentals drills that emphasize note-to-note analysis and big picture drills that focus on harmonic rhythm and phrase relationships. Includes a glossary, listing over 100 significant terms. Available in an Instructor's Edition (MHID 0-07-332718-2 / ISBN 978-0-07332718-1), which includes answers to exercises as well as suggestions and teaching strategies that help present the material in the most effective light.